Pressure on schools to provide more Science, Technology, Engineering, and Math (STEM) resources to students, combined with the needs of business for a properly trained 21st century workforce have driven Marmion Academy to create the Computational Prototyping and Research Center (CPARC). CPARC is an engineering program at Marmion Academy that supports simulation prototyping experiments for various companies and trains students with skills that will set them apart after graduation. Simulation prototyping is popular among companies seeking to increase the return on investment for their innovation efforts. Creating traditional physical models is costly and slow. Simulations allow companies to narrow down candidate designs more rapidly than building expensive physical prototypes. Supercomputing power is now readily available for CPARC students through Amazon Web Services (AWS) to perform the CAE (Computer Assisted Engineering) analyses. CAE software is becoming easier for students to access through their Amazon Workspaces. CAD/CAE is a lot like video gaming – a virtual environment where students feel very comfortable. Nonetheless, the STEM concepts that underlie this new virtual learning environment still require the knowledge of educators and expertise of experienced company engineers overseeing the process. CPARC is an experiential team approach to learning. The team has no limits and, thanks to collaborative tools like Amazon Chime, often extends to individuals worldwide. The students have many resources to guide their decisions and steps – and to learn new concepts in the context of the company’s problem. “As teachers, we need to get out of the way and let them learn with their own style,” says Dr. Pinks. A recent example where industry came to CPARC for help was to vet engineering structures for hurricane housing built by Rock Werk Systems, Inc. of Naperville, Illinois. 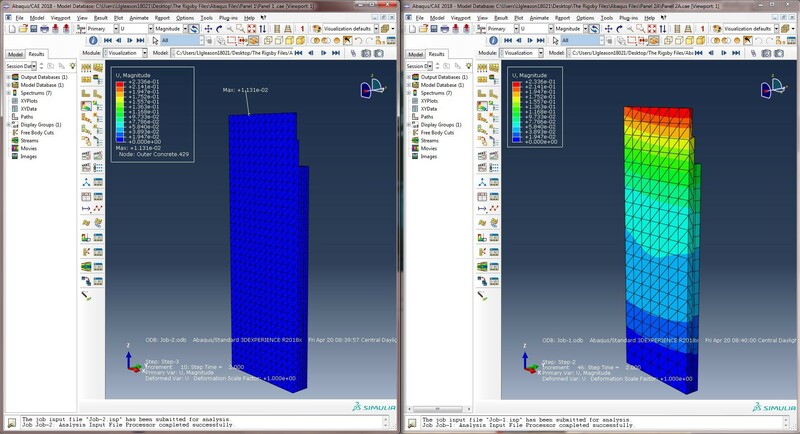 CPARC students are comparing the response of two rectangular walls (pictured below) to hurricane forces applied as pressure on identical outer faces using Dassault Systèmes SIMULIA Abaqus® and SIMULIA XFlow®. Embracing simulation prototyping using the CPARC model of business/education collaboration is truly a win-win. Marmion’s CPARC Engineering Center offers students, outside businesses, and educational partners a collaborative learning/research atmosphere. CPARC is a place where students begin addressing real world problems and see their hard work translate into college/career success. Marmion Academy was a 2017 City on a Cloud Innovation Winner. Through our City on a Cloud Innovation Challenge, we recognize local and regional governments as well as private and public schools and districts as hubs of innovation. Apply to win $50,000 in AWS Promotional Credits today.